I don’t think you’re ready for my jelly. No, really, I don’t think you are. It’s so good! I just discovered how to make chia seed jam with all of the fresh berries I’m getting from the farmer’s market, and I’m a little obsessed. How will I ever buy jam or jelly from the grocery store when I’ve discovered how easy it is to make my own?! Answer: I won’t. Aside from how easy it is to make you’re own jam, there is so much you can do with the jam once you’ve made it. It’s such a brilliant natural sweetener! I found the recipe for the thumbprint cookies on Oh She Glows – an ah-mazing vegan site! If you’re a lover of healthy food, check out her blog. I made a couple of adjustments to her recipe to add protein. Oh so good is what I call this one! 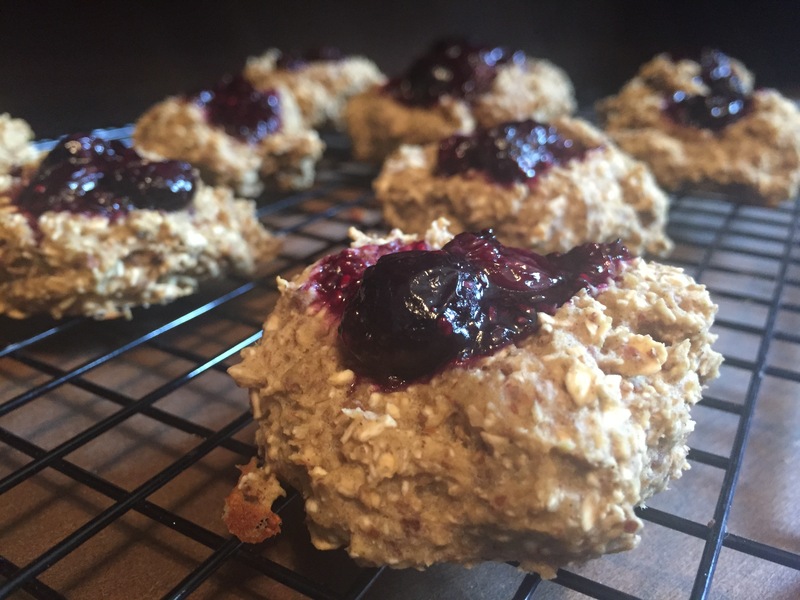 I happened to find the chia seed jam on her site as well, so I’m sharing that recipe below. From that recipe, I’ve started to venture out and make some other jams – today I make fresh peach and blackberry jam…OMG. I’ll share that with you guys soon. Until then – do yourself a favor and go make these! For the jam: In a medium pot, stir together the raspberries, syrup or water, and chia seeds until combined. Bring to a low boil and reduce heat to medium. Simmer, uncovered, for about 10-15 minutes, stirring frequently, until the raspberries break down and the mixture thickens slightly. Remove from heat and stir in the vanilla. Transfer the mixture to a bowl and into the freezer for about 15-20 minutes, until cool. In a food processor, add the oats and pulse until a coarse meal forms (see picture in blog post). In a large bowl, mash the banana. Stir in the rest of the ingredients, except the jam and nut butter. The mixture will be very wet and dense. With a retractable ice cream scoop or a spoon, scoop the dough into 8 mounds. The cookies do not need to be spaced far apart on the baking sheet as they don’t spread out. Press your thumb (or small spoon) into the centre of each cookie to create a well. Fill each well with 1 heaping teaspoon of jam. Bake cookies at 350F for 11-13 minutes, until the cookies are slightly firm, but soft and doughy in the middle. Transfer cookies to a cooling rack for 10 minutes or so. If desired, serve cookies with your favourite nut or seed butter. They also taste great with a pat of coconut oil or vegan butter!